Where are the Western Isles? The Western Isles of Scotland are remote both geographically and culturally from mainland Britain. The chain of islands is about 100 miles long, sitting 50 miles off the Scottish mainland where the blend of Gàidhlig and Viking culture sets this place apart from the world. For the pilgrim, there is an unspoiled quality to the place: the best preserved standing stones in Celtdom are to be found on this western fringe of Europe; there is a bleak, harsh beauty here. En route, we also visit remote parts of the dark interior of the Highlands of the Mainland - very different in feel, but equal in natural beauty, majesty and spirituality both old and modern. A sense of the tour can also be found in the video at the page foot. It is for those who wish to understand Celtic spirituality in its own landscape by spending more time walking the land than in a vehicle. These are active tours (see Activity note). It is for those who want see parts of Scotland beyond the tourist haunts (indeed, we actively avoid them, especially on Skye). It is suitable for those on a return visit to Scotland wishing to go deeper into the less known places and cultures. 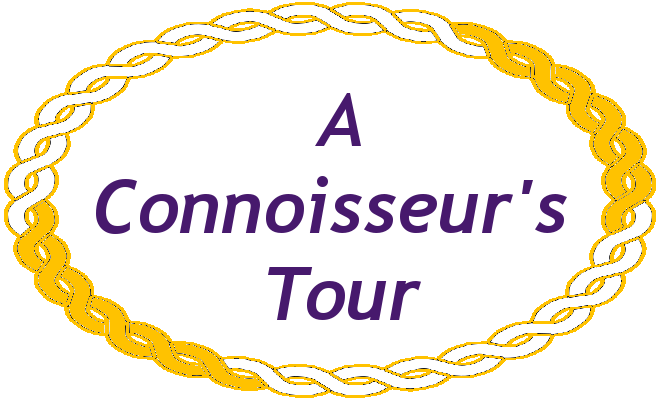 This is why it's a connoisseur's tour. 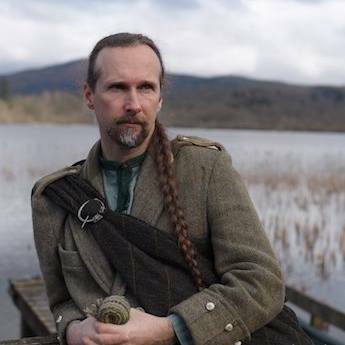 Scot AnSgeulaiche, myself, bringing Celtic history and legend. Hamish Douglas Burgess. New for 2019! bringing art and music. 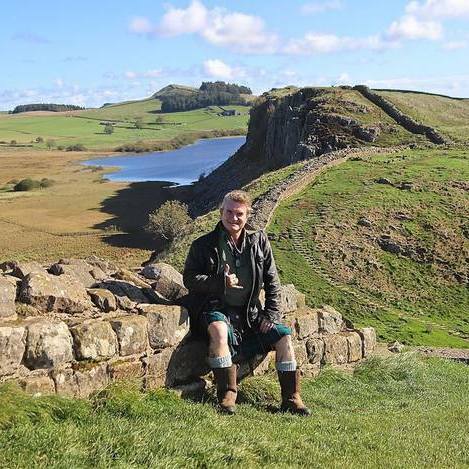 These first two days set a ground to understand the ancient beliefs and sense of spirit of the Scots, and the land that formed them. Day 1: We travel north west from Edinburgh through the Trossachs to the coast, giving time for experiencing the important things in life, such as the Three Sisters of Glencoe, eerily beautiful. 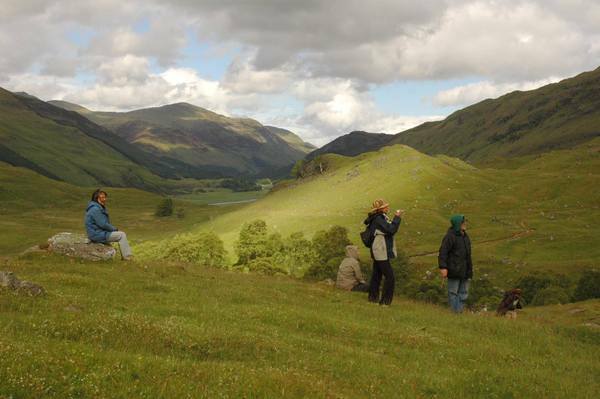 We'll go hiking in Glen Nevis in the afternoon, amidst the foothills of Britain's tallest mountain and the home of the Cailleach Bheur the Goddess of the Hills, possibly the oldest diety in Europe. Walking is an important activity to understand what is here - your feet must tramp the ground. There will be Tales of Cailleach Bheur to open your understanding of her place in Scottish beliefs. Day 2: We travel further west and into Glen Elg a place of green lushness that has been lived in continously for at least 2000 years. We then reach and begin to explore our first island, Eilean a'Cheò, the Isle of Mist, Skye. Day 3: We explore the northern loop of Skye, beginning with a hike into the range of hills known as the Quiraing with its gravity-defying pinnacles and crags and its almost unprecedented complete lack of folkore to explain its strange atmosphere. The canvas here is huge and humans seem very, very small. The views are stunning. We'll enter the Fairy Glen where the locals say that the Wee Folk have inhabited since long ago. This will be a place for sacred practice, both together and alone. Day 4: It's on to the ferry to Harris! If the guests are interested, we'll delve a little into a particular kind of Scottish Spirituality: Na Hearradh - the new distillery on Harris, making whisky and gin. We'll talk to the locals about why this is a "Social Distillery". We spend the afternoon exploring our fourth island, Bernera Mòr, around Bostadh's beaches and Iron Age Norse village remains. As we cross Lewis we'll stop at one small part of the complex that is the Calanais stones, just to give a more technical introduction to the relationship between solar, lunar and standing stones that we'll need for the next day. Day 5: The destination of our pilgrimage: we will step back in time as we walk amongst some of the most incredible formations of standing stones in the world at the interlinked stone rings and alignments that make up Calanais. We'll spend the whole day here so there will be plenty of time to make ceremony as a group and also solo time to just be, to appreciate the interplay of landscape and standing stones. 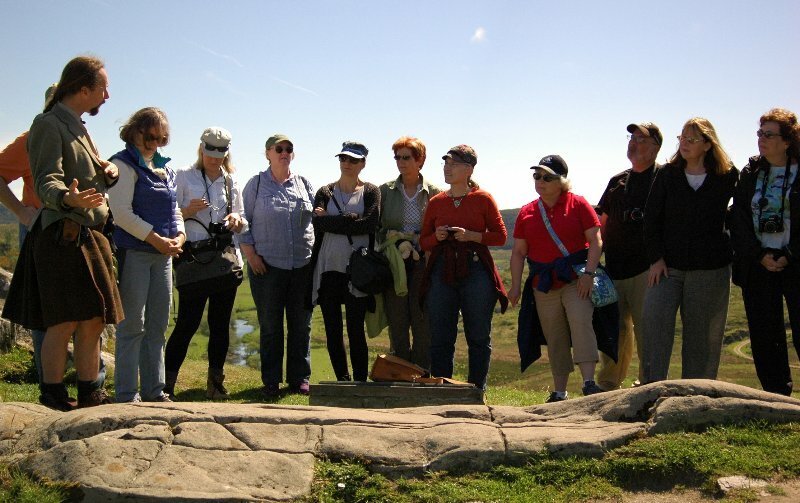 Afterwards, for those who have a more active bent, I will lead or direct guests to the more hidden parts of this complex, which covers many miles; for others, there are a miriad of experiences to be found just by listening to the landscape and the sea inlet around these ancient sites. 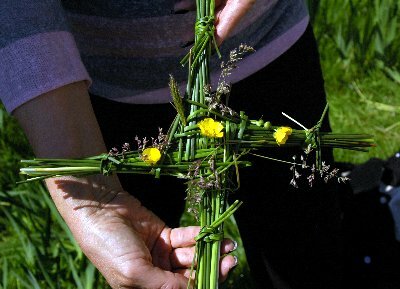 At some juncture, we'll make Brigit's Crosses (Saint and Celtic Goddess much revered in these parts) from the luachar that grows here. You can keep the cross or leave it at a sacred site. Day 6: we'll cover two milenium as we explore a well preserved thatched home from the 18-20th Century, a restored Viking site from a thousand years ago and a fort from the Iron Age Celts. We'll see if our weaver friends are working and experience the process of the famous Harris Tweed. Did you know the world famous Harris tweed is made by only a couple of hundred people, each working from home? The making of a' Chlò Mòr (the tweed) will give guests another perspective on the culture and landscape of these isles: tweed is taken very seriously here! Day 8: Back to the Highlands and heading into what might be regarded as the ancient spiritual centre of Scotland. 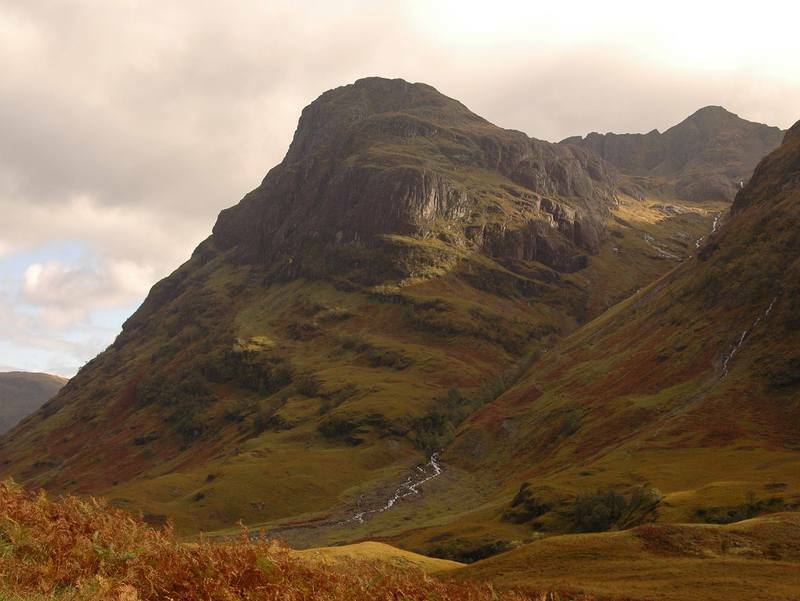 We'll spend two days walking remote glens in Perthshire, visiting curious and ancient Goddess sites, along with those associated with Fiona MacCumhal and the Fianna of Celtic legend. If the weather is right, we'll make one of the above a venue for our popular picnic lunch. Our journey returns us to our meeting point in Edinburgh near the end of the day and we bid a sad farewell. Note: the itinerary is always developing, right up to the last minute, but is fairly close to the above description. Rest assured that where ever we take you, it will be just right! Evenings of Tales with harp - folklore and history. * Note about accommodation: The evening before the tour begins is not covered, nor the evening of the last day of the tour, back in Edinburgh (to allow onward travel), but we can recommend a hotel near to the start and end point of the tour, to assist your travel plans. During the tour, my preferred type of accommodation is high standard B&B. This allows you to stay with and meet locals, gaining the richness of their experience. What are the Western Isles like? As with all our tours, they are active. We spend most of the day on our feet (rather than in a vehicle) with the activity level ranging from strolling through towns to hiking at a good pace into remote glens. Guests are expected to carry their own luggage between vehicle and accommodation. In some remote places, the next toilet break might be two hours away, with only Nature's Bathroom as your fallback. When you apply for a place on the tour, you will be asked for some health and medical details. This is used by the guides to assess whether you will be comfortable on the tour. A good yardstick is the time of your one minute mile walk on the flat: test yourself. If you can walk a mile in 17-20 minutes, you will find the tour about right.